I have weakness for quirky ingredients or flavor combinations. You might have noticed along the way. However, for quite some time I have cooked more or less “regular” dishes. This will end today, as I want to share a recipe for home-made and honey-sweetened goat cheese with you. I’ll be honest with you: it wasn’t love at first sight. Goat cheese had always been a savory ingredient to me. Sweetening it with dried fruit and honey sounded good, but my palate had to get used to it. However from the first bite on, there was something about this cheese, that made me go back to it and have another bite, another spoonful spread on some bread, etc. Before I knew the first batch was eaten up. There is something about making your cheese at home. It’s so easy and rather quick. After that it’s up to you if this cheese will have a subtle or bold sweetness: by adding more or less honey and by deciding which dried fruit you want to add. The nuts give it a crunch that goes well with the creaminess and sweetness of the cheese. I love it in the morning or as snack between meals. Bon appetit! Bring goat milk to a boil over medium heat. Take off the heat. Immediately stir in the lemon juice. Leave standing for about a few minutes, so the milk can curdle. Pour the milk lemon mixture into the cheese cloth (or alternatively a clean kitchen cotton towel), that has been laid out in a bowl. Tie the ends of the cloth together so it becomes a bag. Hang it on a wooden spoon and let the bag hang free over the bowl. The whey should be able to strain out of the cheese cloth for at least two hours. Before taking the cheese out of the cloth, squeeze the cloth itself to extract more liquid from the cheese. Transfer the cheese from the cloth to a bowl. 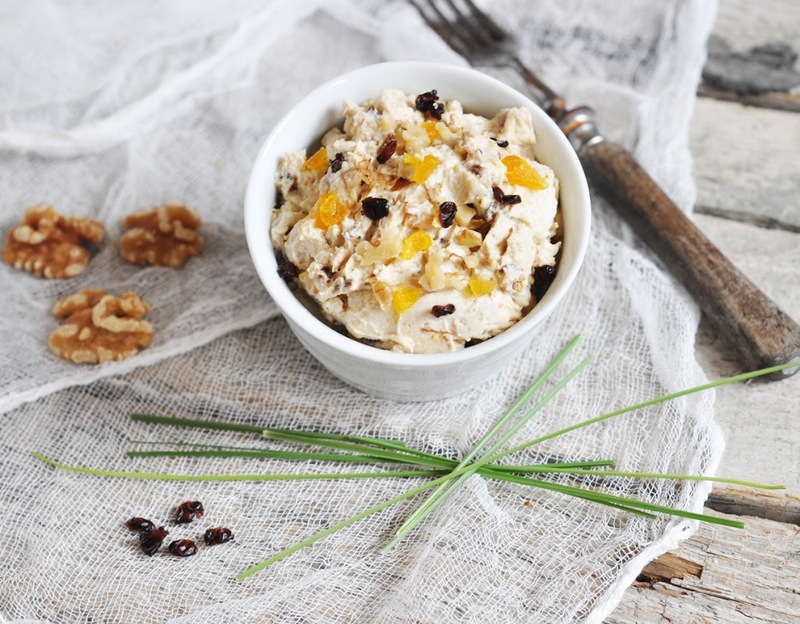 Stir in the honey, dried fruits and walnuts. Ready to serve.